Integrated Regional Water Management (IRWM) is a collaborative effort to identify, integrate and implement water management solutions on a regional scale that increase regional self-reliance, reduce conflict, and manage water to concurrently achieve social, environmental, and economic objectives. ​Through IRWMs, collaboration and integration builds upon relationships with public agencies, non-governmental organizations, disadvantaged communities, Tribes, farmers and other interested stakeholders. This approach delivers higher value for investments by considering all interests, providing multiple benefits, and working across jurisdictional boundaries. Examples of multiple benefits include improved water quality, better flood management, restored and enhanced ecosystems, and more reliable surface and groundwater supplies. What are the measurable benefits? ? IRWM Plans and Projects. 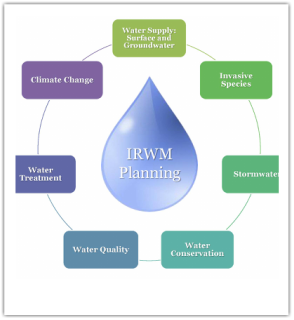 IRWM plans and projects integrate all aspects of water management, including water supply (surface/groundwater), water quality, water treatment and reuse, flood control/management, drought preparedness, and environmental stewardship/benefits. As well, the best IRWM plans and projects to consider and address improvements to California's native Tribal water and natural resources and endeavor to ensure equitable distribution of benefits to disadvantaged communities and vulnerable populations. Since 2010, IRWM has awarded over $823 million for planning and implementation projects throughout the State.